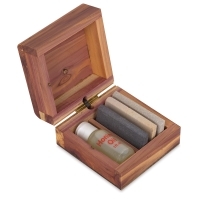 This four-piece sharpening kit includes a 1 oz bottle of Honing Oil and three slip stones — soft, black, and hard. 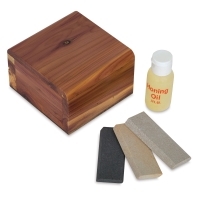 The sharpening stones measure 3" × 1-1/4" × 1/4" each. They're tapered on one side and rounded on the other. 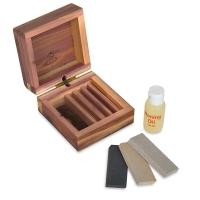 The UJ Ramelson Sharpening Stone Set comes in a custom cedar box.